The River is flowing too fast for safe canoeing. Warnings remain in effect along the Mississippi River at Wabasha and Mcgregor. In addition, debris that has fallen across the canoe trail creates eddies which are dangerous for canoers. 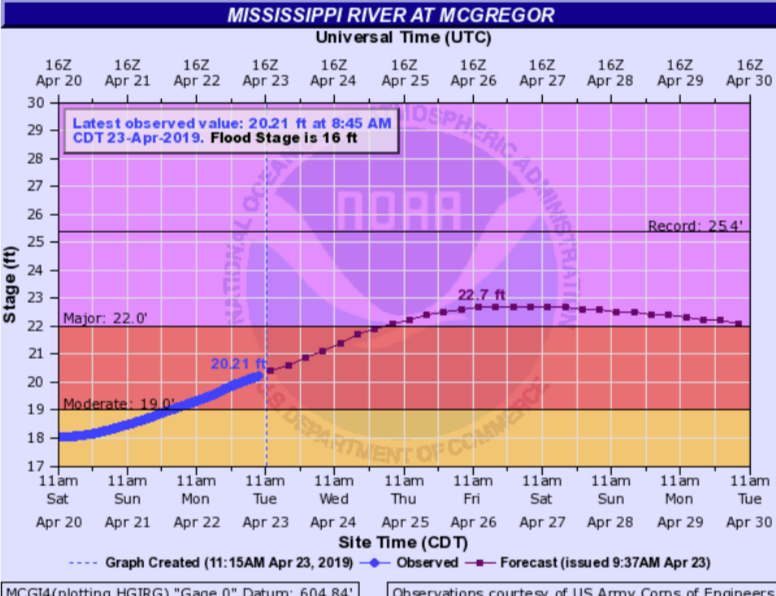 River forecasts take into account both observed and forecast precipitation. Even with the absence of additional rain in the north, the river continues to flood. During the best times for canoeing and kayaking, the river flows at 85 thousand cubic feet per second in the Mississippi River at McGregor Iowa. The canoe/kayak area is located in Woodyard slough where the water flows at a much slower rate. 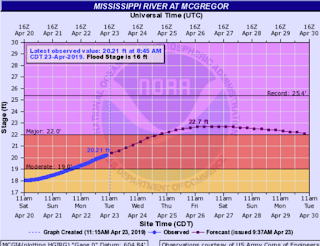 At the predicted flood stage The Mississippi River will flow at 246 thousand cubic feet per second. Canoes and Kayaks will be removed from storage racks at the Wyalusing State Park Boat Landing. .
Needless to say, and an understatement at best, it seemed like a lo-o-ng cold winter. A delightful spring season is coming to Wyalusing State Park. Soon wildflowers will be springing up and the bird migrations will be greeted by hundreds of birders who come to Wyalusing State Park. It also brings the opening of The Friends of Wyalusing State Park concession stand – known as The Bluff Top Shop. The Bluff Top Shop 2019 grand opening will be April 19, 2019. It will be open during the weekends in April – Friday from 4 PM-8:00 PM, Saturday 9AM-8PM, and Sunday 9AM-1PM. The concession stand will also open for school groups renting canoes by special appointment. Summertime hours begin in May. The hours are 9Am-8PM seven days a week. This year, park visitors will experience many positive changes Once again, the concession stand will offer certified wood for campers. The hardwood bundles are stored inside, assuring a welcome campfire in the evening or excellent heating source for the creation of campfire culinary delights. ALL PROFITS FROM THE BLUFF TOP SHOP ARE RETURNED TO THE PARK. The concession stand also offers other camper supplies like eating utensils, batteries, tarps, matches, etc. Some food items like marshmallows can also be purchased at the concession stand. Candy bars, chips, and soda pop are also available. Frozen treats and hot items are a favorite among park visitors. Canoe rental is available through the concession stand. Canoes are large enough for three adults or two adults and two children. Single person kayaks are also available. All canoe/kayak rentals include paddles and life jackets. The concession stand staff will look forward to your visit. Each staff person is knowledgeable about the area and is here to serve everyone. The Friends of Wyalusing State Park would like to welcome all visitors to explore and enjoy your park and appreciate its history. We are a private nonprofit organization dedicated to enhancing the interpretive and recreational experience of visitors to the park. We provide funding for much of the interpretive projects, information, and programming here at Wyalusing. As we look back we know that this beautiful park would not be possible without the dedication of many people over the years. Starting in the l860's, a young man named Robert Glenn not only dreamed of but strived to make this a special place for future generations. The forward-looking Wisconsin state legislature decided, in the first decade of the 20th century, that this area needed to be preserved. Paul Lawrence, the first park manager, worked his entire career to make that dream a reality. On to modern day where many dedicated professionals and volunteers continue to preserve and protect that heritage and your park. 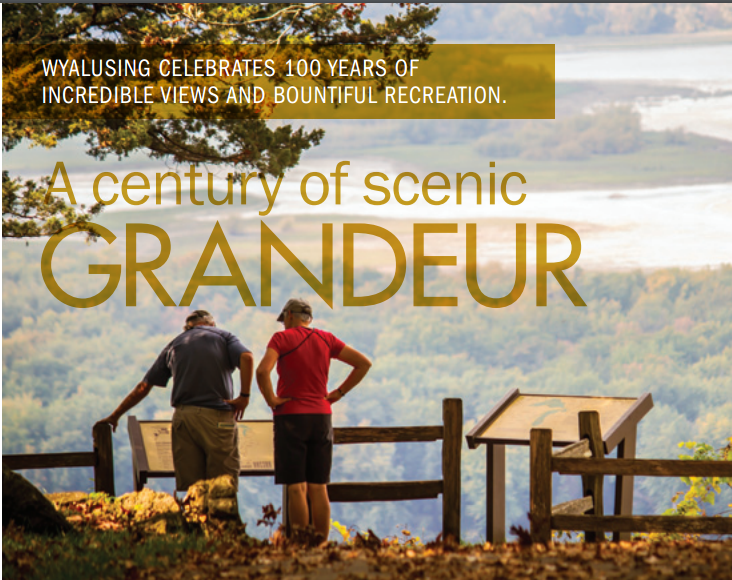 Your support will help Wyalusing State Park continue to be an inspiration to future generations of visitors like you. While you are here at the park please drop by the concession stand located adjacent to the Peterson shelter building. The concession is operated by the Friends of Wya1using State Park and proceeds from sales go back into the park for interpretive needs. We are also the first state park friends group to establish an endowment fund with the Natural Resources Foundation of Wisconsin. Your contributions to this fund will live on indefinitely, providing growth to be used for interpretive activities. You can learn more by picking up a brochure at the visitor center, the concession or our Website. Many people come to Wyalusing and leave inspired. A few turn that inspiration into assistance for this magnificent place. It is our sincere hope that you truly enjoy your stay here at Wyalusing and hope that our efforts have enhanced your experience. Wyalusing State Park is located over 500 feet above the confluence of the Mississippi and Wisconsin River. The park contains 2600 acres including stunning bluff views, river wetlands, bluff-top forests, and home to hundreds of species of plants and animals including 284 distinct bird species. The logo for Wyalusing State Park and The Friends of Wyalusing State Park features the Kentucky Warbler and Chinquapin Oak tree. Within the park boundaries, three threatened species: Cerulean and Kentucky Warbler and Acadian Flycatcher can be seen throughout the summer. 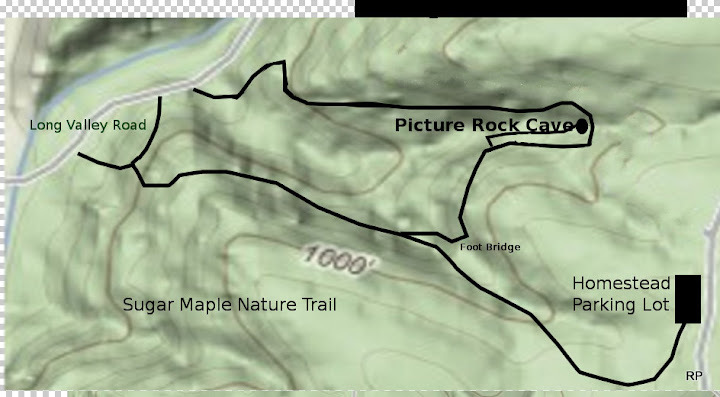 All are more southern species that nest along the steep slopes of this park. During the spring and summer, the rolling song of the Kentucky Warbler can be heard throughout the forests. The Kentucky Warbler spends most of its time on the ground in moist, leafy woodlands in search of insects. Despite its bright colors, it can be surprisingly hard to see in the shadows of the deep forest interior. The Kentucky Warbler winters in the tropics of central Mexico and the Yucatan Penninsula. A group of Kentucky Warblers is collectively known as a "Derby" of warblers, perhaps, because it is named for the state in which it was first discovered in 1811, by Alexander Wilson. The Chinquapin Oak, a Wisconsin Special Concern plant. It is native to eastern and central North America, ranging from Vermont west to Wisconsin and south to South Carolina, western Florida, New Mexico, and northeastern Mexico from Coahuila south to Hidalgo. It is very rare in Wisconsin, barely reaching the southwestern corner of the state on a few very dry sites near the Mississippi River. Chinkapin oak is generally found on well-drained upland soils derived from limestone or where limestone outcrops occur. Occasionally it is found on well-drained limestone soils along streams.